The Cincinnati Bengals have two Pro Bowl pass rushers in Carlos Dunlap and Geno Atkins. A deep draft class of defensive ends offers them more help to dominate the AFC North. Bengals fans have officially made it to draft season. If you look at the many “mock” draft’s posted, you might notice that most analysts have edge rusher listed as the biggest need for the Queen City. Luckily, this year’s class has plenty to offer. Let’s take a look at some prospects that can help make this defensive line formidable once again. At this moment, there are four pass rushers that are considered locks for Round 1. The top guy is Myles Garrett who at 6’5″ and 270lbs, is an athletic freak. The Texas A&M product is thought to be the first guy who will be chosen, likely keeping him out of reach when it’s time for the Bengals to select. Luckily there are some potential impact guys who will be available when the Bengals pick comes around. Solomon Thomas has been the most popular pick in this spot across the internet. The big man from Stanford stands at 6’3″ and pushes the 280-pound mark. He’s strong with good hands and can kick inside which is the versatility this coaching staff loves. 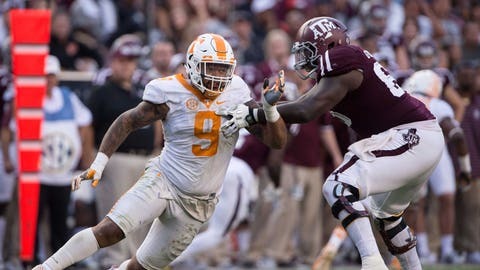 Derek Barnett out of Tennessee is another trendy pick for good reason. The junior dominated the SEC with 13 sacks and 19 tackles for loss. Posting those numbers in that conference is no easy task. The former Volunteer is a little smaller than your typical Marvin Lewis defensive end. However, his talent and production cannot be ignored. The fastest riser in this group is Michigan’s Taco Charlton. He has the size this organization loves at 6’6″ tall. Charlton had a huge year for the Wolverines, posting double-digit sacks and tackles for loss. Scouts are falling in love with him and a strong showing at the combine could push the talented lineman into the top 10. If the first round doesn’t work out there is plenty of potential impact on day two. DeMarcus Walker would bring tremendous value coming out of Florida St. A versatile lineman with a big motor, this All-ACC defender brings a nice resume with over 15 sacks this past season. Another fast riser is right up the road in Tarell Basham of Ohio. His terrific showing during Senior Bowl week opened the eyes of many scouts making this former Bobcat a potential steal on day two of the draft. You could also put Tanoh Kpassagnon in this category coming out of Villanova. Towering at 6’7″tall, this small school athlete had tremendous production. However, the level of competition raises some questions. Round’s 2 and 3 also provide some intriguing tweeners in Illinois’ Dawuane Smoot and Jordan Willis out of Kansas St. Scouts believe both prospects can play with their hands on the ground as well as standing up, making them names to keep an eye on. Speaking of names to keep an eye on, The East-West Shrine game provided two possible late round gems. Trey Hendrickson of Florida-Atlantic is a high effort guy who could be a nice pickup in the later rounds. Arkansas’ Deatrich Wise Jr. is another name to remember with good size coming out of the SEC. Who will the Bengals look to for help? That’s the million dollar question. Thankfully, this draft provides plenty of answers.